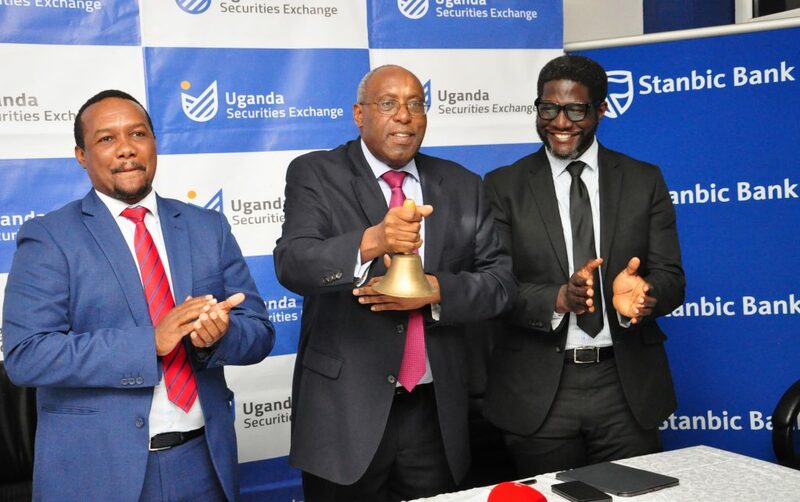 Flanked by Bwiso (left), Katto (centre) rings the bell to usher in trading of the Stanbic Uganda Holdings Company shares at the USE today in Kampala. Sam Mwogeza, the Stanbic Chief Financial Officer also witnessed the event. April 10—Stanbic Bank Uganda (SBU) has reorganized its operations to enable the addition of non-banking financial services for the benefit of both SBU customers and other users of financial services who are not normally their customers. Stanbic Uganda Holdings Limited offers non-banking financial services including but are not limited to; stock brokerage services, insurance brokerage services and fund management. In 2018, Stanbic Bank obtained shareholder approval to reorganize its corporate structure to include a holding company, all of which was subject to regulatory approval which has since been obtained. The Stanbic counter is now open for trading after a week of voluntary suspension, which was to allow for completion of the reorganization. Counters are now open for trade under the new name ‘Stanbic Uganda Holdings Limited’. Katto said the changes mean moving from the current legal and operating structure where SBU was a public company listed on the USE that provides banking services directly to customers, to a group structure that comprises a holding company now listed on USE and several subsidiaries, including the banking subsidiary. “The reorganization will now allow SBU to fulfill its vision of being the leading financial services organization, by allowing it to conduct other financial services in addition to banking. Stanbic Bank Uganda (SBU) is currently regulated by Bank of Uganda under the provisions of the Financial Institutions Act (FIA). Under the provisions of the FIA, the Company is permitted and restricted to undertaking financial institutions business as defined under the FIA,” Katto said. As a holding company, SBU can enjoy flexibility to engage in financial technology (fin-tech) partnerships including a software subsidiary thus providing better risk management with increased visibility and control of the fin-tech partnership whilst facilitating greater innovations for the benefit of SBU’s customers and the larger banking industry. SBU is also looking to own its head office and plans to look for financing and hold these premises in a separate subsidiary under the holding company.